Dryer is turning the drum but there is no heat to dry the clothes. This fault can be caused by a multitude of different components that may have failed. It can also be the result of a clogged dryer vent hose. Follow the steps in order below to fix your dryer that will not heat. NOTE: If you live in an older home, you may have a fuse box. Check to be sure the issue you are having is not being caused by a blown fuse. Check that the dryer is not on “AIR FLUFF” mode. If your dryer is on the correct setting then move to step 2. Check to be sure dryer vent hose is not clogged and restricting airflow. If so, how to clean dryer vent hose. If your dryer vent hose is not clogged and the dryer is able to properly vent out the air move to step 3. Be sure you know how to use a multimeter to check for power before attempting this. Remove power by unplugging the dryer cord from the wall. Check for 220/240V across the two hot legs. Check for 110/120V from neutral to each hot leg. If you have the correct power voltage going to your dryer then move to step 4. Remove power by unplugging the dryer cord from the wall before testing for continuity. When you check continuity on the above parts, remove a wire from the part so you do not read back through a different path. If everything above has tested OK, then look for the wiring diagram that should be inside the control panel or find your service manual. This will tell you if certain contacts should be open or closed during different drying cycle settings. Need help trouble-shooting an issue with my Whirlpool Cabrio dryer. Had a recent problem with no lint collecting on the lint trap. Found that there was a large hole in the duct so we replaced it and took the opportunity to vacuum out all the lint that had collected that we could see. Also replaced the metal tubing in the cement wall attached to the duct work and to the outside and replaced the outside plate with a new plastic cover. The drum spins, the dryer itself heats very well but there is still no lint collecting and the clothes aren’t drying. And when I put my hand against the vent cover outside, there is no air flowing through it. My son did the work and replaced the duct behind the dryer. He clamped it to the hole attached to the dryer and then inserted it into the new metal tubing that runs through the wall and outside. He used special duct tape but I noticed that a little bit of air is allowing air from the outside to come in, but I can’t imagine that this would prevent the clothes from drying at all. Any ideas?? I really don’t want to have to call someone in to fix this. Hi, I need help with my Hotpoint dryer model DLB1250BDL ,I replaced the old motor type ” T “for a new one type “V”, the old one uses a external centrifugal switch and all the wires from the dryer are individuals, the new motor (S58TVMGA) we17x10010 came with a harness jumper with no numbers printed in it. From the dryer cames, black(1), brown (6), orange (2), yellow (4) , blue (5) the numbers is from the old external centrifugal switch. I have a Whirlpool 110.63932100. I suddenly had no heat. Opened it up and found a blackened dime wedged against the thermal fuse and the screw holding the fuse in place. I pulled out the dime and checked for continuity of the fuse. It was positive for continuity as were the other components. Inclding the element and dial. Checked circuit breakers as well. Still no heat. Any guesses? I have a Roper dryer. It spins, but I barely get any heat. I am getting 240 through the hots and 120 grounded at the outlet. I get continuity through the dryer cord. I get continuity through the heating element, and it physically looks to be in great condition. I checked the thermostat, thermal fuse, thermistor and the high-limit thermal fuse all have continuity. All wiring and wire harnesses look to be perfectly fine. I have no lint in the hose or lint trap. I even took off the lint trap housing and made sure it was nice a clean. My dryer turns on but does not heat; i replaced the element and thermostat. However it still does not heat. I pulled the controlled thermostat in the front i tried to check for continuity: the prongs on each end gave me a reading while the two prongs in the middle did not? Have you checked the THERMAL FUSE at the back of the dryer? Have you checked all wiring and wiring harnesses to be sure all electrical is checked good? Any burnt, loose, or brittle wiring may be your issue. Test all components in the dryer with a meter to be sure all is working. Yes all of the wires have been checked; everything looks fine. I wanted to ask when checking the cycling thermostat fuse in front of the dryer (on the blower housing) it shows continuity on the outside prongs but does not show anything on the two inside prongs. Is this unusual? The only other item to check sounds like it may be the timer (not too sure, thats why I’m on here). Thanks in advance for all of your efforts. My Maytag dryer spins but won’t get hot. I have a Samsung dryer model DV407AEW. It turns on and spins and heats for a minute. The heat stops and continues spinning. I replaced the entire heating element assembly. 3 months later it went out again. The ducts were clogged, so I cleaned them and the lint traps are clean. I replaced the high limit thermostat and the dryer still didn’t work – no heat. So I replaced the entire heating assembly again. No luck. Only other symptom is that it always goes to the towel cycle. What part number is the heating element that you replaced? Was it OEM or a generic? Have you checked that all wiring is not burned, loose, or touching anything? Is the heating element constantly going out or is the fuse constantly blowing? Turned out to be the Thermistor. I had to replace the thermistor and the high-limit thermal fuse and all is well again! Thanks for your help! I’ve just replaced the heating element on a hot point tcm580p. The tumbler started to heat again then stopped working? Samsung dryer dv422ewhdr, won’t heat. Replaced heating element, thermostat, and overtemp fuse. Incoming line is good. Still no heat. Dryer turns on, drying light blinks, cooling light stays on. Check control board for any sign of damage. I have a fairly new (about 1 1/2 years old) Admiral clothes dryer model number AED4675Y21. The heating element got very hot before burning out. I replaced the heating element and checked continuity on the thermal fuse and it checks out but dryer still will not heat. What am I missing please help thanks. If you replaced the heating element and tested the thermal fuse on your Admiral dryer and it still will not heat… BE SURE you don’t have a lint blockage in either the dryer itself, the vent hose, or in the wall. Check that first and get back to us. I have a Kenmore Electric Dryer model# 11060022010 that will not heat. I have checked the voltage and is good and have replaced the element, thermostats and fuse. The only way to get it to heat is by by turning the timer knob back and forth a few times. You most likely have a bad timer motor on your dryer. Replace it and you should have your NO HEAT issue solved. Kenmore Dryer Timer Knob. My dryer typically won’t heat up, but if I go and flip the breaker outside it usually resets and will heat up on the timed dryer setting. Then another day or so and there’s a good chance it won’t heat up. It always works mechanically. We’ve cleaned the vent and from what it sound like, the thermal fuse would need to be replaced if it was breaking in order for it to work again. Any ideas? It sounds as if something is flipping the breaker? This may mean your dryer is overheating and the thermal fuse does not blow but instead the breaker flips. You may want to check to see if the thermostats in your dryer are in working order. 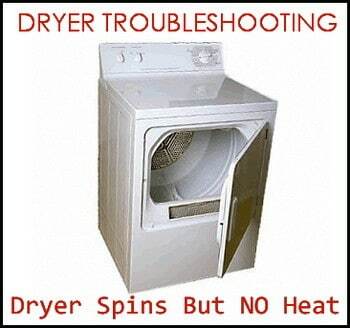 If not, the dryer can overheat and flip the breaker. Also, clean internal dryer and vent. You may have lint hidden in dryer you do not see and that may be the cause of your overheat issue. Get a canister vacuum and use a small wand and vac out the inside of your dryer with the dryer unplugged. I have checked the vent, the lint trap, the heating element, the voltage, etc. what else is it. Check the THERMAL FUSE at the back of the dryer. My Samsung dryer is not heating and it shuts itself off after a few minutes. I have replaced the thermostat, fuse , element and the cord. I have also cleaned out the lint from everywhere and checked the fuse box. What could still be the issue here? Have you checked the control board for loose wire harnesses or burnt areas? If everything you have described that you have done was replaced correctly, check the control board. It has 240 volts coming in. It does have 2 breakers (locked together). Wires are connected. I tested the timer and found no faults. Venting system clear. At the end of my rope. Any more advice? Have you tested with a meter that you are getting 240V, or assuming that since the breaker is 240V? Would also throw in there to look at all wires in dryer and trace each one to see if there is wire issue. I have an Estate dryer model # 1106072010. I have replaced the high limit thermostat, cycling thermostat, heating element, and the thermal fuse. It still will not heat. What should I do next? Have you checked what the voltage is coming into your dryer? Also, it may be that your breaker is faulty or it has 2 breakers for the dryer. Two 110V breakers instead of one 220V or 240V breaker. Have you made sure the venting system is clean and clear? Have you tested or checked to be sure all wiring harnesses are connected to the controls? A loose wire can cause your issue also. Let us know and we can assist further if needed. I have a Samsung Dryer that is only 2.5 years old. It will not heat and ive checked every fuse, cutoff, element, and thermostat on the machine with a multimeter. And had an electrician friend come to look at it with me. I cannot find anything online about my specific model on fixing it or troubleshooting it. It’s model number DV400EWHDWR/AA. CAN ANYONE HELP ME OUT? please and thank you. If you have tested every single part that allows your dryer to heat, but it is still not heating, you may have a wiring issue. Check all wiring and if applicable make sure wiring harnesses are tight and secure. Have you checked the thermal fuse at the back of your dryer? Are you getting the proper voltage to the dryer? Could there be an issue with the electrical plug? Is the control panel and timer working properly? Check the wiring behind the knob and display to be sure all wires are secure. I have a Samsung electric dryer not heating. I replace the heating element and all of the fuses. I still do not have heat. Any ideas? Thanks in advance. If you replaced the heating element AND the thermal fuse, the next part that may be bad that is causing your dryer to not heat would be a thermostat. Have you tested the thermostats? What is the model number? You may need to simply replace the control selector switch if it is an older dryer. No heat could mean blown thermal fuse, improper voltage. Timer not advancing could be faulty timer or not correct power.